For someone who do not read Chinese, nor understand much for that matter, I listened to quite a number of Mandarin and Cantonese songs growing up. Jacky Cheung (张学友) was one of them, together with the other three which made up the Cantopop Four Heavenly Kings (四大天王). Of course, he has always been the better singer even among the heavenly kings. So, when Jacky Cheung's 1/2 Century Tour in Singapore was announced, it was one of those concert that you believe you had to attend before it is too late. I expected amazing perfect pitched singing, which he delivered effortlessly. I expected a medley of his greatest ballads, which he delivered. I expected him to jazz the night up with songs from his latest jazz album Private Corner, which he delivered with a cozy piano and double bass set. I expected some form of theatrical showmanship, which he did by starting the concert with a set of songs with lots of emotions and acting. 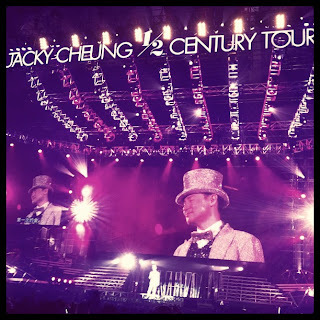 What I did not expect was a 50-year old Jacky Cheung (that was why the tour was named 1/2 Century Tour in case you are wondering) wearing shimmering costumes and top hat, tap-dancing and he even did a full split! Of course, there was a set which made me feel like I was in a rock concert - with bright lights and loud guitar to complete it all. He even did about three dance songs, with the same dance moves from his earlier days. Jacky Cheung, at half-a-century old and about a quarter century of songs under his belt, is still going strong. With his amazing voice and oh-so-perfect singing, I am pretty sure that he will keep singing and entertaining for many more years to come. Oh, there was a disappointment though. Not from Jacky Cheung, but the audience! Even when he was dancing away to amazing beat and music, most of the audience were sitting down as if they were watching a movie - no body movements, no lip movements, no swinging of body to the music. I felt like screaming "stand up and dance, people, you're in a concert!" Well, I must not have spoken it out loud, because many of them could not even wait for Jacky Cheung to get off the stage before rushing out of the door. So, the concert was a success for me - Jacky Cheung was amazing. I wished I could have said the same for my fellow concert goers.